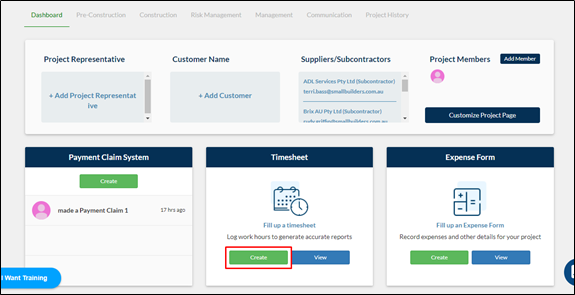 From your navigation bar, go to Construction Phase > Accounts > Timesheet. Or you may use the search bar in the upper right corner of you portal by typing in 'Timesheet'. 2. On the timesheet form, Click View Templates. 3. You will be redirected to the Timesheet Templates page where you can view the templates made. Click Add New Template. 4. A pop-up window will appear where you can input the details of the template. Type the Template Name and fill out the details of the template. 5. Once the template is filled out, click Submit to save the template. 6. Once a timesheet template is created, it will appear on the Timesheet Template table. You may opt to update the template by clicking Update or Delete the template by clicking delete, both under the Action column. 7. You can now use the saved template in your next submissions. To learn more on how to use a saved template to your timesheet, click here. You can also save a timesheet you are about to submit as a template for future use. To learn more, click here.